I am visualizing a collection of process with GraphViz. Each process consists of some Read or Write operations in program order. Naturally, it is desirable to arrange the operations in the left-to-right order with respect to each process. My Problem: How to enforce the left-to-right node ordering in the rank environment? During rank assignment, the head node of an edge is constrained to be on a higher rank than the tail node. If the edge has constraint=false, however, this requirement is not enforced. Based on the above statements, (I guess) constraint = false option takes effect between different ranks instead of in the same rank. 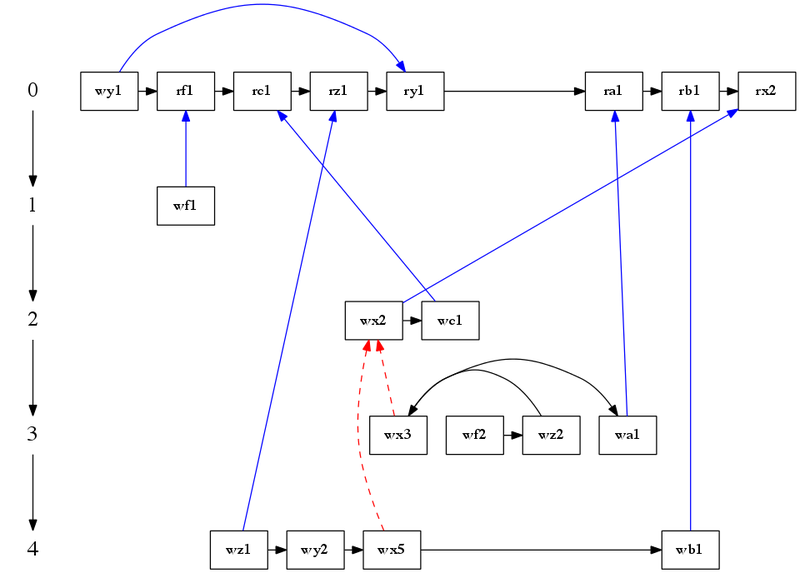 Graphviz---random node order and edges going through labels: With surprise, the constraint = false option helped the "finite state machine" a lot in the same rank. Again, it does not save me from the trouble. graphviz: circular layout while preserving node order: The process graph is dynamic both in number of nodes and edges. So, it maybe not attractive to use the absolute position for nodes (to cause many edge crossing?). Thanks for any suggestions. And executable code will be appreciated very much. I am not quite sure that i've correctly got your problem, but try using this and comment please if it is what you want. I've added invisible edges for correct ranking of nodes and used rankdir to use left-right layout. Not the answer you're looking for? Browse other questions tagged layout graphviz graph-visualization or ask your own question. How do you force rank on a node in dot? Why does Graphviz/Dot act so weirdly to this particular code? Force the left to right order of nodes in graphviz?